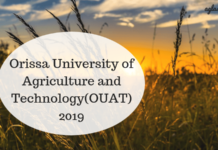 OUAT Application Form 2018 is issued by the Orissa University of Agriculture and Technology, Bhubaneswar. Interested applicants can fill the application form of OUAT 2018 entrance exam and submit the same before the due date. In order to appear in the exam, candidates must fill the online OUAT 2018 application form, and pay the requisite application fees. 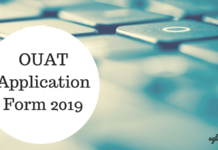 Complete details on how to apply, form submission procedure, and other details relevant to OUAT Application Form 2018 are provided on this page. Latest: Submission of online Application Form – B has been started. Students can check the same from below. Application Form: Click here to fill the Application Form-B online. Candidate’s full signature (height: 100px, width: 150px, File size: 10-20kb) Please use only jpg/jpeg format for photo and signature. The candidate is advised to link his/her “Aadhaar Number” with mobile number. The candidate must have Aadhaar Card as it is mandatory to submit the Aadhar Number in the online Application Form-A. Application form A for OUAT 2018 will be available at www.ouat.ac.in or through the direct link, which is provided on this page. Eligible candidates can apply for OUAT 2018 Entrance exam by filling in details in the online application form and making payments for the application fees. Detailed information such as how to apply, application fee, is given below. 1. Fill up the online application. 2. Make payment (Through online payment gateway ). 3. Print out of Application Form-A with payment details for reference. The Candidate can also apply online through the Common Service Centre located at the nearest area by making payment through cash and take a print out of Application Form-A with payment details for reference. How to fill Form – A? The candidate can have access to the Application Form-A by clicking on the direct link provided on this page. Enter the correct mobile number and validate it through OTP generated in the mobile number. Mobile number validation is important because all the communication regarding admission will be sent as SMS to the valid mobile number provided by the candidate. The applicants are advised to be careful while filling in the online Application Form.He/She must enter correct (a) Aadhaar Number (b) Mobile Number which is in use (c) e-Mail ID (e) Choice of Examination Centre and other information. The application fee of Rs.1200/- can be paid through Internet Banking / Debit Card/ Credit Card of any bank. Payment can also be made through nearest Common Service Centre(Jana Seva Kendra) in cash mode. Online submission and Payment in cash can also be made through Common Service Centre (Jana Seva Kendra). Once candidate successfully pays the fee, he/she will receive a message confirming the acceptance of application in mobile phone and also in e-mail. Fees once paid, cannot be refunded to under any circumstances. After successful payment, the candidate can take the printout of computer generated filled Application Form-A with payment details, which the candidate should retain for future reference. Submission of application will be completed after successful payment. It is compulsory for candidates to submit the online Application Form-B for admission into Under Graduate Courses under OUAT. For submission of online Application Form-B, the candidate should access the direct link that will be updated on this page. Applicants need to enter their Entrance Examination Roll Number, Mobile Number, and Date of Birth. The Application Form-B will be opened with partly filled in data from Form-A and the rest part such as academic qualification, category, etc in relevant fields will be filled up by the candidates carefully. Also, the candidate will be required to upload a relevant scanned copy of the documents as mentioned below (file size within 200KB). After the successful submission of application Form-B, a confirmation SMS will be sent to the registered mobile number and e-mail. The candidates are advised to take a print out of Application Form-B and should retain it for future action. Note: The candidates are advised not to send any hard copy of the application and documents to the University. Mark sheet of 10th standard . Certificate of 10th standard showing date of birth. Mark sheet of +2 Science. SC/ST/Green Card / Ph. Handicapped certificate from the competent authority for the respective reserved category (refer Clause-3.2). In case of NRI Candidates, all the documents as per clause-3.6 in Brochure. Note: 5 copies of said passport size photograph be retained with the candidate for future use at the time of admission. 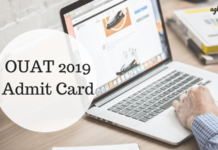 OUAT 2019 Admit Card – Get The Direct Link To Download From Here! Sir, I want to know where and when will I find the application form for OUAT? I am interested in the agricultural course, please do guide me by providing proper information about the link to where I can register. wait betta abhi to patrty suru hui he …. My money was cut from account but the fee had not complete ..it remain unpaid ..how i solve it??? Sir, what is the document required for Ouat form B . Now Chse certificate not coming to College. 12 marksheet must required for fill form B but 12 certificate is optional. Will i have to send hard copy of ouat B form? ?